Copernicus (9.62°N, 339.92°E), which is easily seen with a moderately powerful backyard telescope, is one of the best-known craters on the Moon. Despite its age (around 860 million years), it is well preserved with over 4000 meters of relief from floor to rim, and the tallest of its central peaks rises approximately 1300 meters above the crater floor. This image, centered on the central peaks, was captured just after dawn (86° incidence angle) as the Lunar Reconnaissance Orbiter slewed west to a 67°angle. 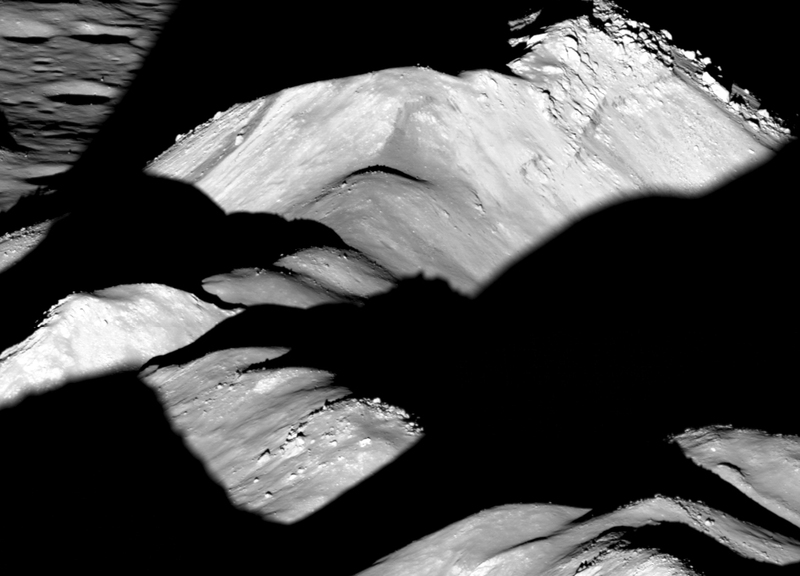 The view shown here is very similar to an LROC oblique image acquired in 2012, however in this case the spacecraft was at an altitude of 89 km, versus 120 km, allowing a closer inspection of the outcropping rock layers.